If you've lost your Michigan driver's license for multiple DUI convictions, I can get you back on the road again, legally. And I GUARANTEE it. If you cannot obtain (or renew) a driver's license in another state because of a Michigan "hold" on your record for multiple DUI's, I'll win a clearance of that hold so you can. And I GUARANTEE it. I win driver's license restoration appeals for Michigan residents whose licenses have been revoked for multiple DUI convictions. I obtain clearances of Michigan holds for people who now live outside of Michigan so that they can go to the DMV in their new state and get (or renew) a driver's license there. Winning back your license, or the ability to get one, means that you will no longer be stuck "bumming" rides. Say goodbye to being dependent on everyone else to get around and hello to being independent once again. I GUARANTEE that I will win your Michigan driver's license reinstatement or clearance case the first time around, or else I will continue to represent you before the Michigan Secretary of State's Administrative Hearing Section (AHS) without further attorney fees until you do. I bank on not having to come back a second time. I want to do everything right and win the first time around every bit as much as you do, and with my guarantee, I am literally "invested" in doing just that. There is no risk - if you hire me, you will win your appeal without having to worry about losing your money because my guarantee means you will pay me one time to get your license back. One of the keys to my success is my formal, post-graduate training in addiction studies. As a result, I have a deep and fundamental understanding of recovery. This, in turn, enables me and my team to present my cases in a way that wins! For example, many people, including some lawyers, still think you have to be in AA to win a license appeal. That’s completely wrong. Most of my clients are not in AA, and yet they win. To be clear, you DO NOT need to be in AA to win your license back. Your lawyer, however, must be able to clearly explain why many, if not most people, are able to stay sober without it. Recognizing how alcohol (and drug) problems develop, and then how they are diagnosed, treated, and most importantly, appreciating the full range of ways people recover from them, is at the core of how my team and I handle license appeal cases, and one way that my office is different from all others. 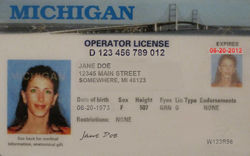 To learn about the Michigan license restoration process in detail, or more about why you should hire a Michigan driver's license reinstatement attorney, click around the following sections of this website. Also, scroll through the Driver's License Restoration section of my Blog, where I have more helpful and useful information about every facet of driver's license restoration and clearance cases than you can find any and everywhere else, combined. I write 2 new articles each week, and over the last decade, have published hundreds of articles that examine every step of the license appeal process in detail. Not having a license can be very difficult. You already know that. Aside from the obvious things, like not being legally able to drive (and scared as heck if you do), even simple things like cashing or writing checks, or proving your age or identity, become difficult and embarrassing. Losing your license truly proves how complicated life can be without one. Nothing beats getting it back, and I can make that happen! This is why I really love being a Michigan driver’s license attorney. I enjoy helping people get their Michigan driver's license reinstated, or clear a Michigan "hold" on their driving record that prevents them from obtaining a license in another state. My client's gratitude after winning is priceless! My team and I handle all the complicated, legal stuff. For the client, it's simple: when I’m your lawyer, I guarantee I will win your case and get you back on the road. Imagine how much better your life will be when you can legally drive again, and don't have to ask around just to get around! Call me when you're ready to get behind the wheel and slide a valid driver's license back into your wallet.